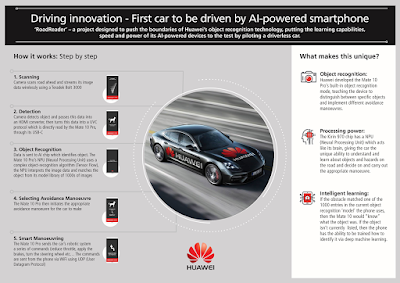 On 27 February 2018, HUAWEI, the global technology leader, has become the first mobile device manufacturer in the world to use an AI-powered smartphone to drive a car. The ‘RoadReader’ project pushes the boundaries of HUAWEI’s object recognition technology and puts the learning capabilities, speed and performance of its AI-powered devices to the test. Unlike other driverless cars, which simply detect obstacles, HUAWEI has transformed a Porsche Panamera into a driverless vehicle that does not just see, but crucially, understands its surroundings. This means that it can distinguish between thousands of different objects including animals and items and learn to take the most appropriate course of action. HUAWEI’s ‘RoadReader’ project takes advantage of the AI capabilities already in the HUAWEI Mate 10 Pro. The device uses AI to automatically recognise objects like cats, dogs, food, and other objects, to help people take pictures with a degree of professionalism. Most autonomous cars currently being developed rely on the computing power of purpose-built chips developed by third-party technology providers. However, as part of its ongoing mission to make the impossible possible, HUAWEI uses readily-available technology in its smartphones, demonstrating its superior functionality and ability to stand up to even the most advanced technologies developed for use in autonomous cars. HUAWEI will be showcasing the RoadReader project and the vehicle’s capabilities at a two-day event at Mobile World Congress in Barcelona (MWC) from 26th to 27th February 2018. Delegates will be invited to test ‘drive’ the car themselves, teaching it to identify and manoeuvre around certain objects.